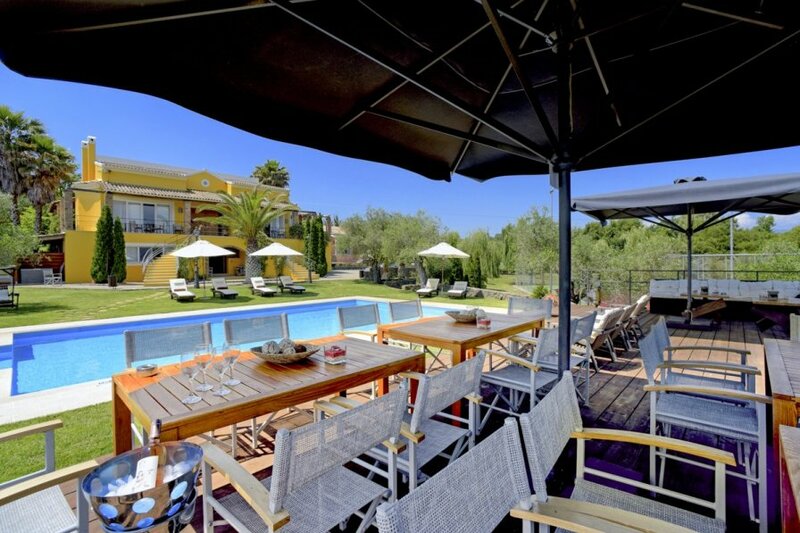 Villa Danilia has an excellent location in the heart of Corfu, close to the upmarket Gouvia marina, with its stylish cafes, fine restaurants and general grocery stores. This luxurious, stylish and contemporary villa is ideal for large family gatherings or for two or three families holidaying together. Boasting nine bedrooms, split over two equally extravagant and elegant villas, the spacious living/dining room's are exceptionally trendy and minimalist in design, with an up-to-the-minute fully equipped kitchen to one side of each and large glass patio doors leading to the covered dining terrace from where you can watch the children splashing around in the inviting swimming pool. The bedrooms are also designed and furnished to the highest of standards, the interiors are complimented by a lavish games room where one can watch a movie on the large screen, whilst the more competitive family members play pool or table football. Another generous feature of this luxurious abode, is the indoor swimming pool and sauna, as well as the full size outdoor tennis court, complete with floodlights should you wish to play during the cooler parts of the day. The accommodation is spread over two adjacent villas; the first slightly larger villa sleeps up to 12 guests across 6 bedrooms. The second villa sleeps 6 across 3 bedrooms. At the owner's discretion, it is sometimes possible for smaller parties with up to 12 guests to simply rent the larger villa on its own, guests will still have exclusive use of the grounds, swimming pools, sauna, gym and tennis court. The scenery around the picturesque hamlet of Danilia makes you believe that you've stepped back in time; such is the natural beauty and abundant evidence of how things used to be. Rolling hills draped in olive groves, lush valleys swathed in all varieties of citrus trees and an explosion of cypress trees lining the scenic, pastoral paths and side roads. Another of the key selling points of this charming hamlet is the fact that you have gorgeous views as far as the eye can see from wherever you have the good fortune to be based whilst holidaying up here and it's less than a ten minute drive down to the fabulous sandy beaches at nearby Gouvia and Dassia. Even Corfu Town, the islands capital can be reached in fifteen minutes by car, so you're not exactly stuck in the middle of no-where, even if that's how you actually feel up here in the stunningly beautiful hamlet of Danilia.